A top ultramarathoner ventures deep into Mexico’s Copper Canyons to learn the secrets of the indigenous Tarahumara—the world’s greatest runners. I strapped on a pair of handmade tire-tread sandals and began running down the dusty canyon path with Arnulfo. Immediately my feet began screaming. Blisters flared and jagged rocks pierced the thin tread. A half-mile later, I hobbled off the trail. A faint smile wrinkled the corners of Arnulfo’s stoic face. “Your feet are soft,” he said. I had journeyed into the Copper Canyons of northwest Mexico to run with Arnulfo and the indigenous Tarahumara, widely regarded as the world’s greatest endurance athletes. Made famous recently by Christopher McDougall’s bestselling book Born to Run, the Tarahumara scratch a living out of barren, rocky soil. Most live in caves and tiny huts scattered throughout four monstrous, river-carved chasms—each deeper than the Grand Canyon. Footloose: A Tarahumara runner wears handmade sandals and carries a stick to help him climb the steep trails of the 47-mile Copper Canyon Ultramarathon. To get from canyon to canyon, they run—wearing handmade sandals called huaraches, which consist of used tire rubber wrapped to their feet and ankles with goat leather. Through deep snow and blistering heat, rugged canyon trails and thorny sagebrush, the Tarahumara travel virtually barefoot, the soles of their feet thick with calluses. A few gringos have lured Tarahumara runners to big races like Colorado’s Leadville 100 Miler. Wearing huaraches, a Tarahumara named Juan Herrera shattered the course record in 1994 and defeated the world’s most highly trained elite athletes. But the reclusive Tarahumara—who call themselves Raramuri, the Running People—prefer to stay in their ancestral canyonlands, where running is integral to their daily lives. Three-year-old children run barefoot through the canyons herding goats. Tarahumara men hunt deer and other prey by literally running them to exhaustion. And once a year, they run the Copper Canyon Ultramarathon, a 47-mile footrace that attracts star athletes from around the globe. Seven-time Western States 100 Mile Endurance Run champion Scott Jurek ran the Copper Canyon Ultra in 2006—and lost—to a 26-year-old goat herder named Arnulfo. I had been chasing Arnulfo’s legend for years. On my first trip to the canyons, I got lost searching for Arnulfo’s cave and nearly slid off a 500-foot cliff. Along the way, I drank giardia-infested water, stumbled upon several marijuana fields, and was held up at gunpoint by a drugrunner. “Lost gringo,” I laughed, muffling the quiver in my voice. He glared from beneath a sweat-stained cowboy hat, his eyes squinted tight in the corners. Without a word, he lowered his semiautomatic rifle and pointed it toward a barely discernible deer path that eventually led out of the canyons. Ancient lands, ancient people: The four river-carved canyons of the Sierra Tarahumara are each deeper than the Grand Canyon. A year later, I returned. This time, I hired a guide, a Tarahumara named Santiago. He and his 10-year-old son, Valentin, led me on a week-long trek deep into the canyons, where we hoped to cross paths with Arnulfo. 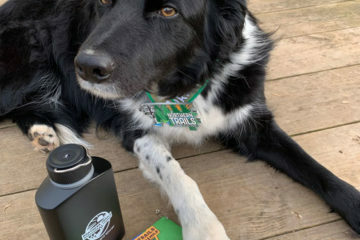 I carried a fully stocked 40-pound backpack; they each toted only a water urn, a bag of cornmeal, and a wool blanket draped across their shoulders. They seemed to dance down the trail, their footsteps light and nimble, while I skidded clumsily on loose scree and stubbed my toes on rocks. Were they naturally imbued with grace, or was it a hard-earned discipline? Camped beside a river one night, I asked Valentin what made Tarahumara different from chabochi—their word for all non-Tarahumara people. “My father taught me four things: speak the native language, grow corn, run, and practice korima,” he replied. Korima—the Tarahumara version of karma—is a spirit of selfless giving that lies at the heart of their culture. When I ran out of water the next day, Valentin filled my bottle with his urn. When we crossed paths with a Tarahumara woman carrying an infant across her back, Santiago helped her ford the river safely. No one asked for help; no one said thank you. Santiago and Valentin led me to a remote village to watch a rarajipari, a traditional running ceremony that lasts for days and can span several hundred miles. At a rarajipari, clans wager, play drums, and drink a special corn beer called tesquino as teams of runners complete circuits through the canyons, kicking a wooden ball the entire way. The winning team finished at dusk on the second day. According to Santiago, Tarahumara runners reach a transcendental state on the trail. They relish the sensation of their bodies in motion. The pain stops hurting. They hear trees talking to them. 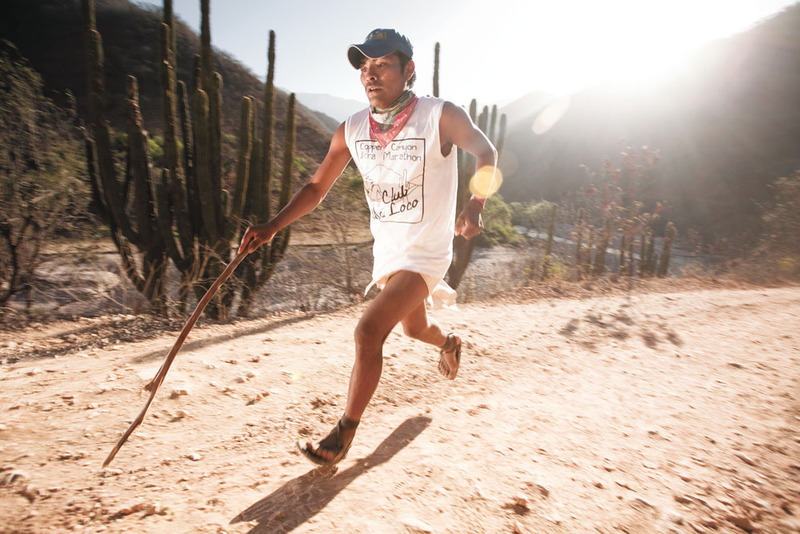 For centuries, Tarahumara survival has depended on running. Instead of warring with conquistadors, missionaries, and Mexican militias, the Tarahumara have fled farther into the canyons. Their flight-over-fight response has enabled the Tarahumara to outlast most other indigenous cultures. After the rarajipari, I watched Valentin scramble playfully up a steep cliff and balance himself on a thumb of rock overlooking the river. Were it not for Valentin’s blue Dodgers baseball cap, it could have been a scene from centuries ago. 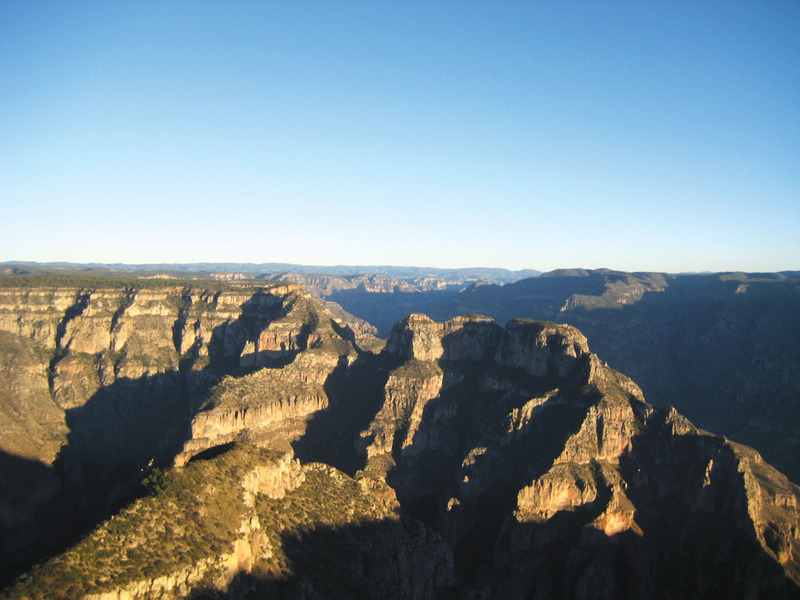 In many ways, Valentin walked the narrow ledge between Tarahumara past and future. He was steeped in Tarahumara traditions, but he also accompanied his father to meetings with the Sierra Madre Alliance, an organization helping Tarahumara defend their ancestral lands and rights. In the past few decades, roads have penetrated deeper into the canyons, and a tourist railway hugs the outer rim. Timber and mining companies are illegally seizing Tarahumara lands. The Tarahumara are running out of space—and time. But some are still holding on. They run deeper into the canyons—and themselves—where they find the grace to endure. Arnulfo wasn’t at the rarajipari. I realized that my best chance of meeting him was at the Copper Canyon Ultramarathon. It was pretty much the only time that Tarahumara mingled with outsiders—primarily for a shot at the winnings: $3,000 for first place, plus one ton of corn for each of the top ten Tarahumara finishers. The race began seven years ago when an American guide nicknamed Caballo Blanco (Spanish for White Horse) staged an informal run with a handful of top Tarahumara runners. It grew quickly into an international event, and now some of the world’s best athletes line up alongside the Tarahumara. I was approaching the end of my competitive running career, and I was looking for one last big race to make my final miles meaningful. So last March, I headed down to Urique, a small riverside village on the canyon floor, to run the ultramarathon. I arrived a few days before the race, and already the village was buzzing with adrenaline. Race murals plastered the plaza walls, and banners draped the single road through town. Mariachi bands played late into the night. Despite the excitement, I couldn’t escape the feeling that I was cheating: I had arrived in Urique on an air-conditioned bus, stayed in a comfy hostel, and carb-loaded my belly with burritos. Most of the Tarahumara had hiked dozens of miles on steep trails to get to the race, subsisting primarily on cornmeal and water. They slept in the woods outside my hostel. Two nights before the race, I wandered out to their campsite to invite them to share my room. I was too jittery to sleep anyway, and I needed all the good korima I could get. Not surprisingly, my invitation didn’t interest them. For several minutes, the Tarahumara sat silent and blank-faced in the glow of their campfire. Finally a short man wearing a magenta tunic and handmade beaded necklace stood and nodded. I recognized him instantly—Arnulfo. Bowl-cut black hair hung over his brown eyes, which were as deep and vast as the canyons. His legs rippled with sinew. Arnulfo came from the Quimare clan, a dynasty of top Tarahumara runners who live high in the canyons herding goats and tending rocky fields of corn and beans. His brothers, cousins, in-laws and nephews—many of whom were gathered around the campfire—were nearly as fast as Arnulfo. They all crammed into my tiny room that night: six on the floor (along with me), four in the bed with Arnulfo, who slept wearing the same threadbare sandals that he’d been running in for over a decade. 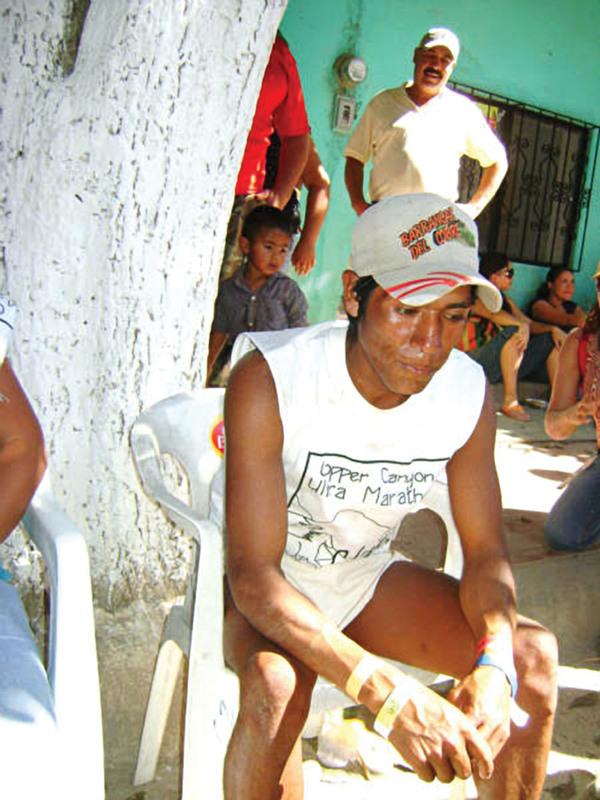 The next day—the day before the race—one of Arnulfo’s friends cobbled a pair of sandals for me. He laced a strap of goat leather through punctured holes in a slab of old tire tread, then wrapped the strap between my toes and around my ankles. That’s when my long-awaited run with Arnulfo ended in humiliating defeat a half-mile later, my feet ablaze with blisters and bruises. 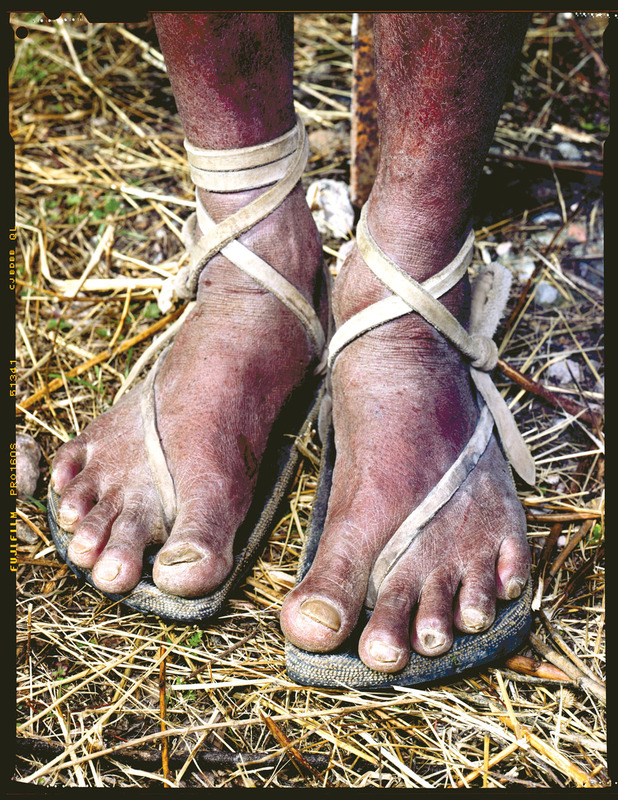 How could Tarahumara run for hundreds of miles in these sandals, especially across brutal terrain? To Nike-clad runners like myself, the answer was painfully simple: they just do it. Barefoot Tarahumara children build calluses and foot strength from an early age on the rocky, rugged canyon trails. I asked Herbalisto, a 65-year-old Tarahumara, how he had run in dozens of rarajipari and completed every Copper Canyon Ultra with such minimal footwear. “Nobody told me I couldn’t,” he replied. The Tarahumara rarely get injured, thanks to their daily running lifestyle and efficient biomechanics. Tarahumara lean slightly forward and maintain a light, short stride on the balls of their feet, so that their leg muscles act as shock absorbers. Most American runners do the opposite: we tend to land heavily on our heels, transferring all of the impact shock to bones, joints, and ligaments. We chabochi also tend to neglect upper body posture. And because we cram our feet into cushioned shoes starting at an early age, we develop weaker foot muscles and sloppy running form. Tarahumara don’t time or measure their runs. They don’t taper before a race or gulp recovery drinks afterward. They are nutritionally deficient by most athletic standards. Yet they consistently dust some of the fastest runners in the world. What was their secret? I had traveled to the bottom of North America’s deepest canyon to find out. An hour before the race, the Tarahumara weren’t exactly resting up. My eleven roommates passed around a jug of tesquino, told jokes, and took turns jumping over a chair to touch the ceiling fan. Even Arnulfo took a few swigs. 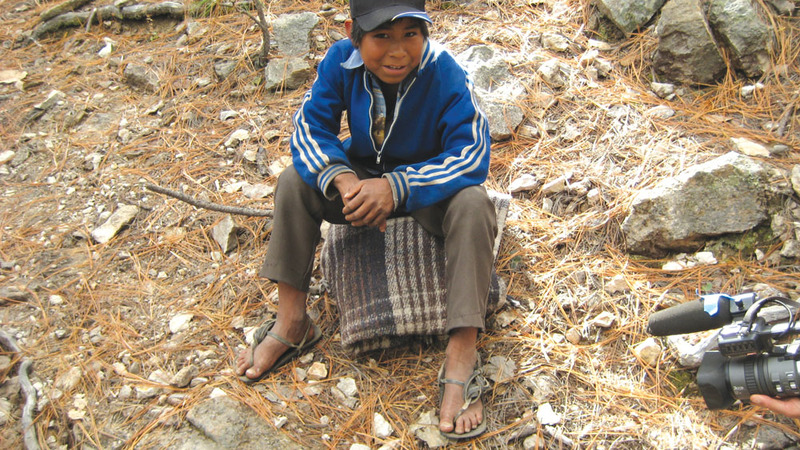 The Tarahumara reticence had slowly evaporated, revealing their playful, lighthearted spirit. Finally, as the first glow of sunlight painted the canyon walls orange, we made our way to the starting line. Over 200 Tarahumara runners were there, along with a dozen international runners, including Hiroki Ishikawa, one of Japan’s top trail runners. I joined a group of elite American runners who were anxiously stretching and loading up their fuel belts with energy gels. Meanwhile, most of the Tarahumara sat quietly along the sidewalks. Some dozed against the plaza walls. Valentin rests along a canyon trail. My thoughts were on Valentin, my 10-year-old-guide, who had fallen from a cliff and died one month earlier. Even sure-footed Tarahumara stumble, and in the steepest canyons on the continent, there is little margin for error. But his death had shaken me deeply. Just before the race start, I printed his name in black marker across my hand. At 7 a.m., race director Caballo Blanco herded runners toward the starting line—a crack in the broken pavement of Urique’s only street—and shouted “Andale!” Two hundred Tarahumara exploded forward, ignited by a fire that burned in their eyes as they blazed by me. Running in the morning half-light felt surreal. I reveled in the raw, bare beauty of the canyons. Tarahumara streamed past wearing colorful tunics and dust-caked loincloths. I ran cautiously at first, still feeling the bruises on my feet from yesterday’s half-mile in huaraches. And I knew the race did not really begin until the sun crested the rim and fully fired the canyon cauldron. The frontrunners—led by Arnulfo and Hiroki—were already a mile ahead of me when I reached the river. At the river crossing, the strong, knee-deep current dislodged many of the Tarahumaras’ huaraches, forcing them to stop and refasten their leather straps on the other side. One Tarahumara runner completely lost his left sandal in the river, so he continued running without it. From the river, we climbed up to a stretch of out-and-back singletrack. One side of the trail dropped steeply, offering dizzying views of the canyons. But I couldn’t peel my eyes off the boulder-strewn trail, made even more dangerous by runners heading in both directions. I nearly collided with Arnulfo as he came flying down the trail. Several times I dove into sagebrush or clung to spindly tree trunks to avoid oncoming runners. 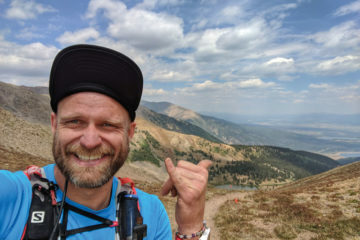 Miles with meaning: Running connects the Tarahumara to their ancestral canyonlands, which are being stolen from them by timber corporations and drug mafias. During the race, I noticed a startling difference between the Tarahumara and the American runners. We were grimacing and gritting our teeth; the Tarahumara were relaxed and smiling. Like most Americans, running for me has often been a chore to check off my to-do list, or part of a prescribed plan toward a finish line goal. But the Tarahumara run because they love it—not just the beneficial effects of running, but the intoxicating experience of gliding across the warm earth, feeling the sand between their toes. Running was a path to the divine—not through folded hands, but callused feet. I was not Tarahumara, as much as I wanted to be. But I could still try to follow in their footsteps by running with gratitude and grace. Over the next few miles, I unclenched my jaw and even let a loose smile unfold. 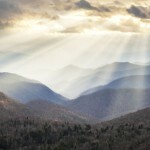 I tried to adopt the light, nimble Tarahumara stride. It worked: I soon found myself floating down the trail, as fluid as the Urique River beside me. I began passing runners—even several of my Tarahumara roommates. I had reached that transcendental state of flow that Santiago had described at the rarajipari. I wasn’t running; my body was running me. My legs seemed to spin beneath me without any interference from my conscious will. Heading into the final 11-mile loop, I surged ahead of Hiroki and found myself running side-by-side with Arnulfo. I should have been elated to be challenging the world’s greatest runner. But really, we were running two separate races: I was racing for glory against other well-heeled international runners; he was running in threadbare sandals for his people and for his life. With six miles to go, my Tarahumara-like flow was starting to dry up in the searing canyon heat. The scorched canyon floor melted the soles of my fancy shoes, and grit from the trail rubbed my blisters raw. Then I thought about 10-year-old Valentin, his broken body lying at the bottom of an arroyo, and realized that my pain was temporary and small. The Tarahumara run ultra distances nearly every day, even as drug and timber mafias rip apart their lands and lives. There is no finish line for them. At the final river crossing, I splashed ahead of Arnulfo. I hung on to cross the finish line first, with Arnulfo finishing only minutes behind me. Afterward, I donated my $3,000 prize to the true champion of the race. Arnulfo used it to buy goats and feed his wife and three children for a year. Real champions wear sandals: Arnulfo rests at the finish of the Copper Canyon Ultra. For the rest of the afternoon, I watched runners cross the finish line, including 15-year-old Maria Juliana, the first female runner. She wore a bonnet and ankle-length dress, and like most other Tarahumara, she looked fresh and at ease at the finish. Forty-seven miles was just a warm up for them. One of my roommates—a teenage farmer named Javier—crossed the finish a few minutes later. The awards ceremony lasted deep into the night. Each Tarahumara runner was presented with a month’s supply of corn, serenaded by a mariachi band, and congratulated by the mayor of Urique. The plaza overflowed with Tarahumara and crowds spilled out into the moonlit street, where more spectators climbed atop the plaza walls to watch. Drumbeats echoed through the canyons. For now, the Running People’s pulse was still beating. Later that evening, as we walked back to our crowded hostel, Arnulfo pulled me aside. He held his hand across his chest, then removed his beaded necklace and placed it around my neck.